The first round in Egypt’s presidential elections, orchestrated by the Egyptian military (the Supreme Council of the Armed Forces, or SCAF), which has run the country since Mubarak’s ouster, was rife with fraud. The candidates receiving the first and second largest votes in the May 23 and 24 election—Mohamed Morsi of the Muslim Brotherhood, and Ahmed Shafiq, former Prime Minister under Mubarak—will take part in a June 16-17 runoff. Hamdeen Sabahi, labeled a “left Nasserist” by the media, finished in third place and is thus out of the runoff. But Sabahi alleges that the 700,000-vote difference between him and Shafiq is dwarfed by the votes of 900,000 military and security personnel whose ballots, he claims, were assigned by the military to Shafiq. Others allege that rather than their votes being assigned, military and security personnel were pressured by their superiors to vote for Shafiq. In any case, under Egyptian election law the highly politicized military and security forces are supposed to be banned from registering to vote in the first place. The rigging of these elections is yet more proof that SCAF has no intention of fully relinquishing its control over the country’s politics. Rules for the elections and their administration were in the hands of the Presidential Election Commission, a body appointed by SCAF. PEC’s rulings are not subject to legal or administrative appeal. Shafiq’s very eligibility to run is the subject of a pending court case. He was briefly banned from running as a sop to mass protests against the participation of former regime officials (whom Egyptians refer to collectively as “felool”) in the elections—protests that the regime met with murderous violence. In the end, the PEC allowed him to run and referred a new law barring top Mubarak-era officials from the race to the constitutional court. Other candidates and Egyptian NGOs also cited many instances of vote buying. And the “Judges for Egypt” movement called on PEC to explain the swelling of voter rolls by an additional 4.8 million in just the last 14 months. Other examples of violations cited by candidates and independent election observers included registering the deceased, polling staff telling voters who to vote for and/or filling out voting cards and inserting them into ballot boxes, prohibition of all observers from sites where votes from regions were aggregated on a national scale, the maintenance in force of the Emergency Law, late amendment of election laws and procedures, polling stations that opened late and closed early, restricting witnesses and the media to a time limit of 30 minutes inside polling stations, and more. Questions have also been raised about U.S. support for the inherently flawed process. The U.S. has been the main financial prop and diplomatic ally of the Mubarak and SCAF regimes, and in recent years has given Egypt’s military $1.3 billion a year. The presidential elections themselves were funded by the U.S. Agency for International Development through a gift of $3 million to the PEC, which went not only for polling supplies but also for “voter awareness campaigns” encouraging participation in the electoral process. During the campaign and afterwards, Shafiq made clear that he was the “law and order” candidate and would continue the Mubarak/SCAF regimes’ repressive policies. Shafiq spokesman Ahmad Sarhan was quoted as saying that Egyptian voters had chosen his candidate because he had promised to “save Egypt from the dark forces” and restore domestic security. Shafiq has declined to rule out appointing Mubarak’s former vice president and hated intelligence chief, Omar Suleiman, to a top post. “‘If it was possible for the expertise of Omar Suleiman to be used in any place, why not use it?’ he said, to big applause” at the Chamber of Commerce meeting. Rightfully fearful of Shafiq, some radicals are unfortunately calling for a vote for Morsi as a lesser evil. But the Muslim Brotherhood has supported SCAF since Mubarak’s fall, differing with it only tactically when under extreme pressure from its membership, and regularly denouncing workers, peasants, and youth who have protested the military’s policies and repression. What’s more, the Brotherhood has repeatedly and explicitly affirmed its commitment to “the free market,” i.e. to the capitalist system. This should be no surprise as its leadership and funding have always been drawn primarily from Egypt’s capitalist class. The record of native bourgeoisies in the neocolonial world make clear that there can be no stable democracy as long as capitalism, and thus dependence on imperialism, exist. A Mosri presidency, coupled with a Brotherhood-dominated parliament, will prove once again the truth of this statement. Other radical forces have declared their refusal to pin their hopes on Mosri. And all revolutionary groups, regardless of their opinion on the second-round vote, have pledged to continue their crucial, day-to-day base-building work in workplaces, neighborhoods, and on campus, and to redouble efforts to construct a genuinely independent political voice representing the masses they meet there. 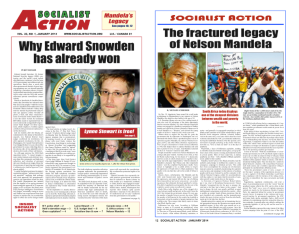 > The article above was written by Andrew Pollack, and is reprinted from the June 2012 print edition of Socialist Action newspaper.